Surprisingly until now, I’ve never had polenta. Never tried it, never experimented with it. If you’re not familiar with polenta, it’s essentially boiled cornmeal. 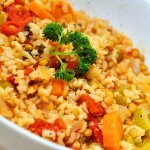 It is a popular choice in vegetarianism because it is relatively easy to make from scratch and incredibly adaptive and versatile. For me as a first timer, I picked it up pre-prepared on sale at the grocery store but after reading more about it, I’ll definitely be making my own next time. This lasagna recipe is super-easy and a great way to use polenta if you’re relatively new to the idea. 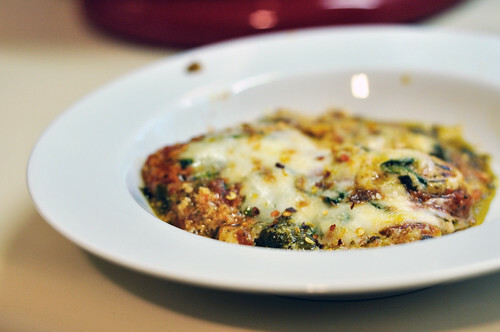 Layered with marinara, spinach, ricotta and pesto, and topped with cheese, it is super creamy and definitely comfort food. 2. 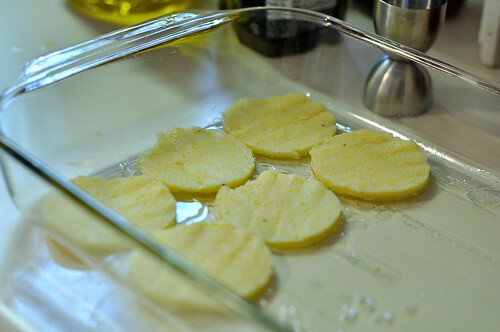 Arrange a single layer of polenta in the bottom of the prepared baking dish. Spread a thin layer of pesto over the polenta. Spoon half of the sauce over the polenta then half of the ricotta. 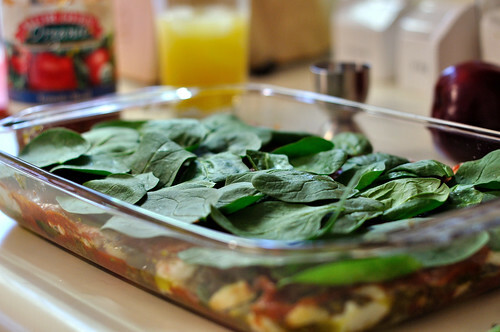 Top with a layer of de-stemmed spinach and repeat for second layer. 3. 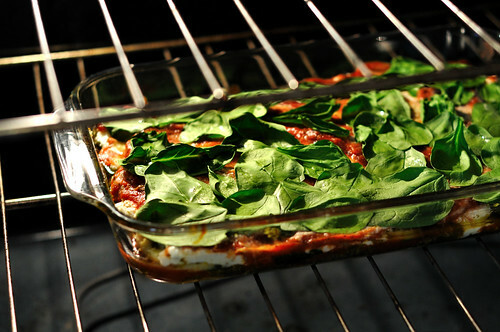 Top with a final layer of de-stemmed spinach. 4. Bake, uncovered, for 25 minutes. Turn on the broiler. 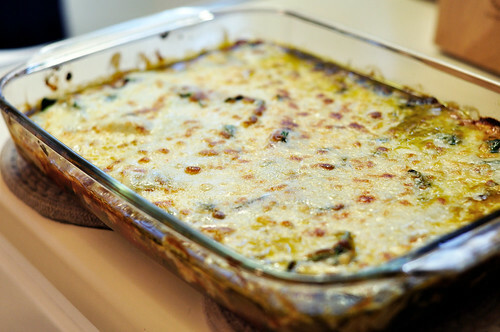 Top lasagna with cheese, and broil until cheese browns and nuts are toasted. 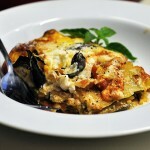 How does this recipe differ from traditional lasagna? It’s a lot lighter. 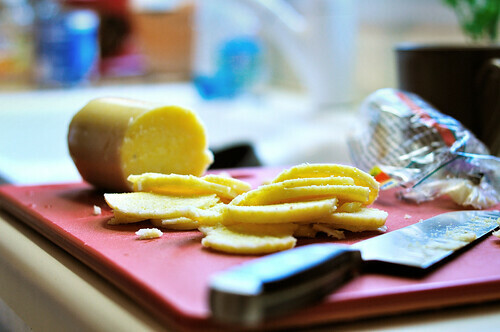 Polenta layers are thinner than traditional lasagna noodle layers. When polenta cooks it melds with the other ingredients, and the finished lasagna eats more like a casserole than a traditional lasagna. The flavor? Way better. The rich combination of the polenta, spinach, and pesto is phenomenal. We couldn’t get enough. Conclusion: I will definitely be canning pesto this fall! 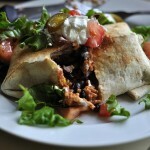 Oh my word – this looks and sounds delicious. I am definitely giving this one a try. Thanks for sharing! Have a blessed week. This looks FANTASTIC!!! I found you via Balancing Beauty and Bedlam’s Tasty Tuesday. Thank you for sharing!!! I cannot wait to try it out!! It took me 5, 238 attempts before my husband would even TRY pesto. Let me tell ya, when he finally did…he coudln’t stop thanking me. I think he will love your recipe as well!! My husband (Neil) hadn’t tried pesto before this either and he was so surprised at what’d he’d been missing! Holy moly this looks delicious! 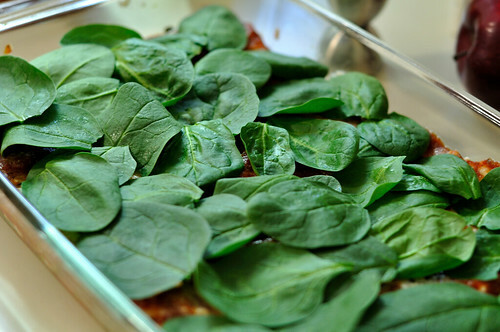 I love adding spinach to whatever I can, so I definitely appreciate it in a lasagna, which is a food I have always loved. 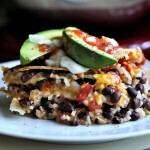 I have never had polenta either, but I agree – this looks like a good recipe for a first timer. Thanks for the pictures and explanation! 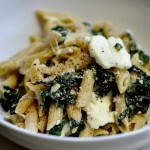 I hope you don’t mind – I’m linking to this recipe in my SFF post this week. I cannot wait to try this. Thanks again for sharing and for the beautiful pictures! 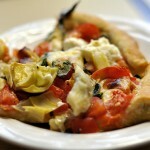 I made this for dinner last night, it was delicious! Even the boyfriend approved. I envy your work , appreciate it for all the good blog posts.